The seat was vacated Jan. 7, 2019 when NDP Member of Parliament Sheila Malcolmson stepped down after winning a seat in the B.C. legislature, with the provincial NDP. Dr. Corfield has an extensive resume having served as vice-president of the Nuu-chah-nulth Tribal Council along with work for her home nation in Ucluelet. She is the chair of the Legislative Council of Yuułuʔiłʔatḥ First Nation and chairs the Port of Nanaimo Port Authority, from which she’s taken leave for the duration of the byelection. She has served on many boards and committees, is a mother and operates her own consulting business. The federal government announced the date of the Nanaimo-Ladysmith by-election on Sunday, March 24. One day later, Prime Minister Justin Trudeau arrived in Nanaimo to support his candidate in her campaign. He posed for photos and toured the Nanaimo Harbour waterfront with Corfield. Other candidates running in the by-election are Paul Manley for the Green Party of Canada, John Hirst for the Conservative Party of Canada, and Jennifer Clarke for the People’s Party of Canada. The NDP Party of Canada has yet to name a candidate. Glen Sanford, B.C. director of the federal NDP, explained that the sudden, short notice of the byelection date has accelerated things for their party. Prior to the announcement the federal NDP scheduled their nomination vote for the Nanaimo-Ladysmith Riding on May 11. But with the election on May 6, the nomination meeting has been moved up to Mar. 30 with four candidates competing for the nomination. Both Chief Robert (Bob) Chamberlin and Lauren Semple announced their intention to run prior to the writ being dropped. Two more candidates were approved this morning (Mar. 26). They are Maeve O’Byrne and Fred Statham. Chief Bob Chamberlin is well-known in First Nations communities around British Columbia. He is the elected Chief for Kwikwasut’inuxw Haxwa’mis and is known for his opposition of the Transmountain pipeline expansion. He is also the vice-president of the BC Union of Indian Chiefs. 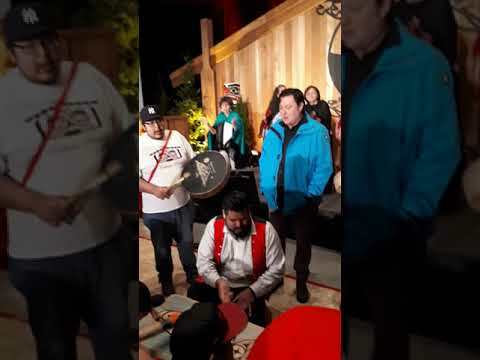 Chamberlin has said that if elected he would hold the Liberal government up to its promise to honour UNDRIP (United Nations Declaration of Rights of Indigenous Peoples). Sanford says that the federal NDP party will select their candidate in the byelection at a March 30 meeting to be held at Nanaimo Conference Centre. They expect to have an announcement by 4:30 p.m. that day. The next Canadian General Election will be on or before October 21, 2019.